In the report “Aircraft Seat Material Market: By Material Type (Aluminium Structure, Foam Cushions, Plastic Molding, Others); By Seat Type (Suite, First, Business, Premium Economy & Economy Classes); By Aircraft Type (RTA, WBA, Others); By Geography – (2018-2023), published by IndustryARC, the market is set to experience an upsurge in civil aircrafts, and with rising passenger traffic estimated to double in the next 10 years, a brighter investment scenario is presented for aircraft seat material manufacturers. Asia-Pacific is the major region for aircraft seating market with revenue of $0.03 billion in 2018 and is estimated to reach $ 0.04billion by 2023. Also, the Asia-Pacific market is growing at a faster growth rate compared to other established markets in America and Europe. Leading regions of Asia-Pacific such as China, Japan, and India, are strongly involved in various aircraft design development activities, which makes it a high demand region for seat materials. Apart from Asia-Pacific, the seat material market revenue in the American and European region are estimated to grow with a high CAGR of 3.6% and 3.4% respectively. Global Aircraft Seat Material Industry by type is classified broadly in the report. A structure is one of the types where seat dimensions include load bearing and seating space, each having elements for securing a seat from the continuous movement between first and second positions. Structuring is very important as this allows spacing. Flight cushions are the most important type of aircraft, providing comfort, looking after the well-being and safety. Materials used in the manufacture of foam cushions are polyurethane, neoprene, silicone, and polyethylene. 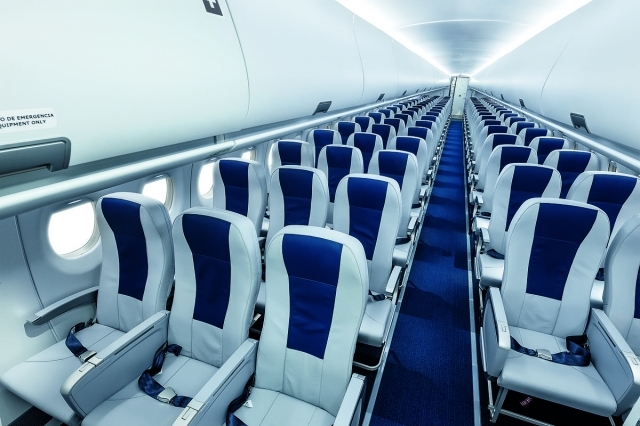 Polyurethane is a vital element in aircraft seat materials as it caters to the requirements. The recent findings state that the rising civil aircraft and aircraft upholstery business are becoming a profitable business segment. Amongst all material types, a polyester frame is a noteworthy constituent among the synthetic fiber industry. It is followed by FR nylon, which is also a vital type of material that is tough and has excellent sliding properties. Furthermore, FR cotton and leather has a broad scale of application in this market. In the test conducted by Special Aviation Fire and Explosion Reduction Advisory Committee (SAFER), it was determined that airplane cushion holds the strongest potential for a fire source. Plastic molding is the foremost type of artificially created non-metallic mixes. Polycarbonate, ABS and decorative vinyl are types of moldings used in aircraft seat material market. This plastic molding embeds liquid fluid, which is structured into different solidified shapes that are used in seat shape types. These extensive varieties of selectable elements provide equivalent value to their operation. • Modern manufacturers are now strongly looking to minimize the weight of airplane seats, which reduces the overall weight of the aircraft. The minimized weight would positively save on fuel costs, provide enhanced travel experience and lower ticket prices. • The growth of global aircraft seating material market includes growth in the demand for new aircraft deliveries, up gradation of aircraft programs, and increased air travel is anticipated to contribute to the market growth. • Attractive composite components of fibers had and will lead the series of innovation in this industry. The use of carbon composites has increased in high-performance vehicles like the jet plane, spacecraft’s, and other aircraft. Regional manufacturers that make it an extremely competitive market, are as follows: Zodiac Aerospace, B/E Aerospace, JAMCO Aircraft Interiors Company, HAECO, RECARO Aircraft Seating Gmbh & Co. Kg and others. Zodiac SA holds the major share in the overall seat material market. It holds almost 32% of the market share, followed by JAMCO Corp. and others, mentioned above.